Today I’ve teamed up with a group of talented stylists and bloggers to share my first room decorated for Christmas! 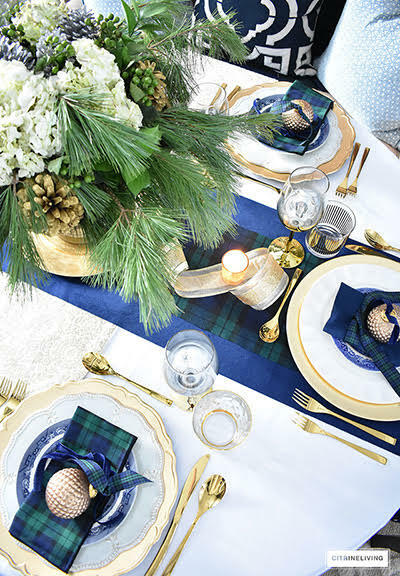 We’re sharing holiday entertaining and tablescape ideas that will be sure to inspire you all for the holiday season. 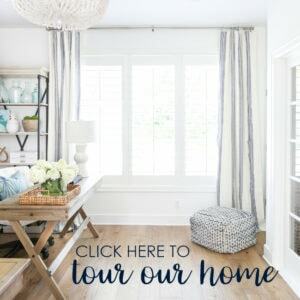 The tour is hosted by Lory from Designthusiasm and if you’re stopping from my friend Tamara’s tour at Citrine Living, welcome! Both ladies are so talented and I love all of their entertaining and styling tips! 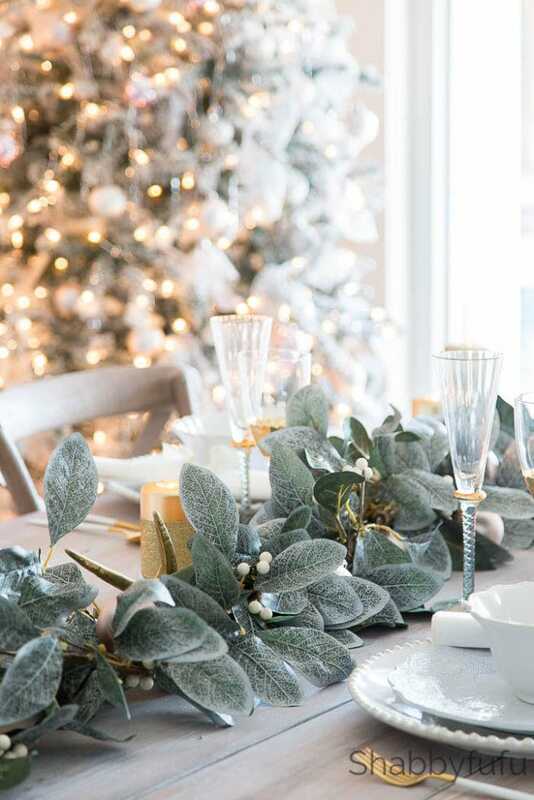 I went with a bit of a coastal woodland theme for my Christmas tablescape this year. Which, in reality, probably doesn’t make much sense, but I love how it looks in our dining room! 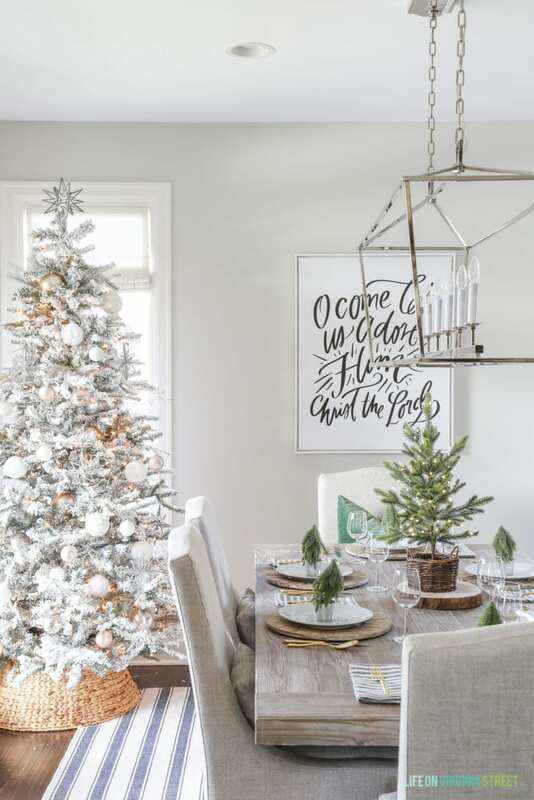 A mix of stripes, metallics, neutrals and pine trees. I bought my very first flocked tree this year, and I absolutely love it! The price was right and it is gorgeous in person. 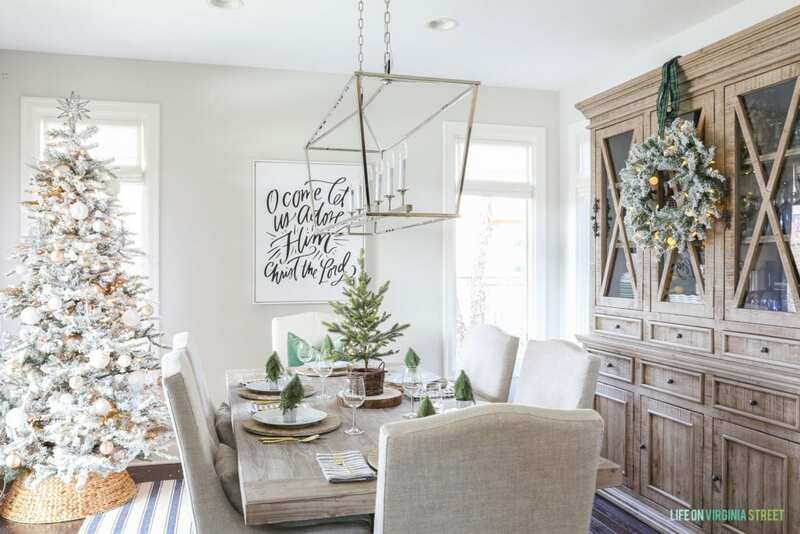 I was a bit skeptical when I first opened the box and it was smashed inside, but after a little bit of love, it couldn’t be more beautiful – and is fairly affordable considering the cost of most faux trees! I think it looks so perfect paired with my woven tree collar. The ‘O Come Let Us Adore Him’ canvas is from Lindsay Letters and is one of my favorites! For my tablescape, I started with these driftwood chargers layered with basic white plates, striped cloth napkins and our gold flatware. 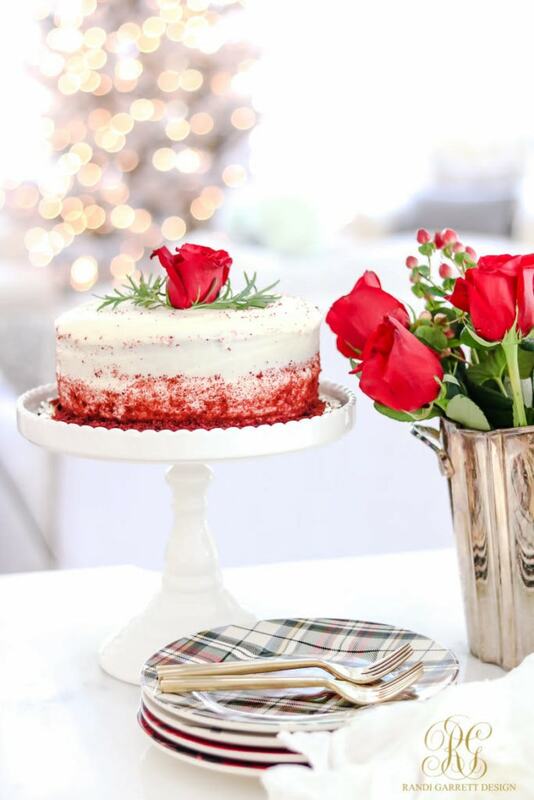 The little trees I used at the place setting are a bit wonky (they’re from the Target dollar section). But, I also thought they were cute and charming at the same time. They are an easy and affordable way to dress up each plate. I’m loving this tree in a basket that I then loosely wrapped with these lights. I then placed it on this wood slice charger. 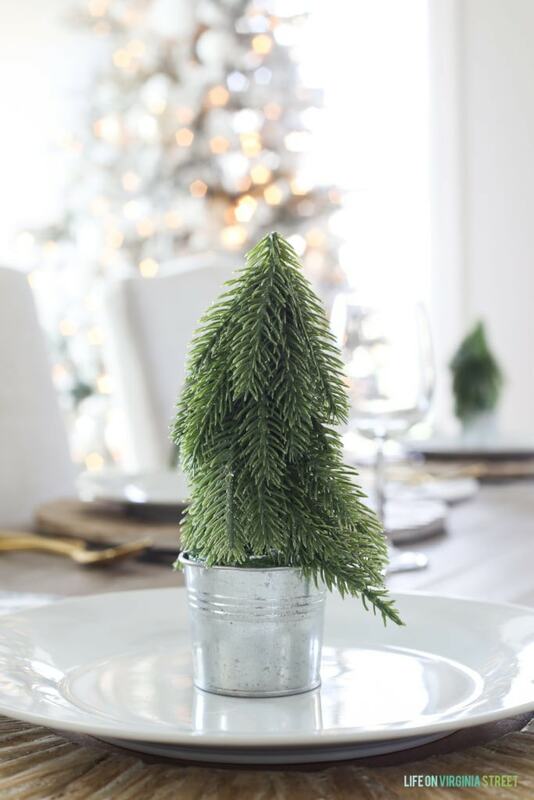 It makes the perfect centerpiece at the table for the coastal woodland look I was going for. 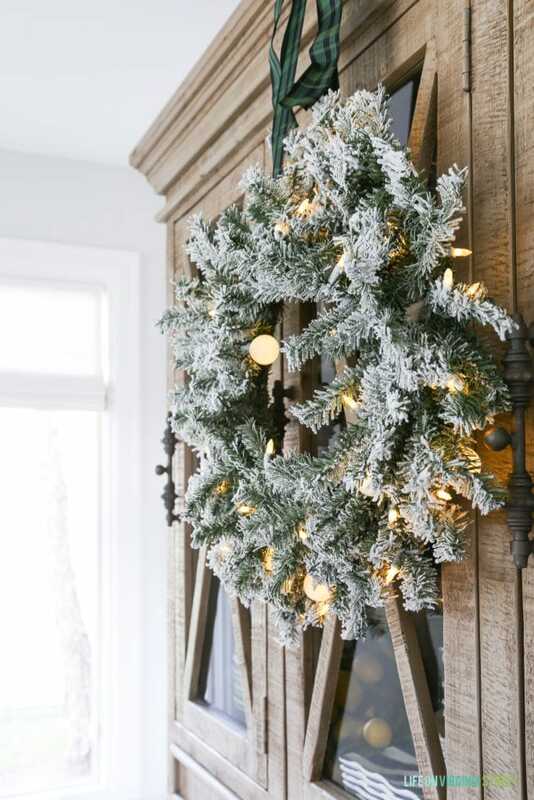 I ordered this gorgeous flocked wreath that has a mix of traditional small lights and larger globe lights. It’s not battery operated, but it does work well over the hutch. I then hung it on the hutch with this plaid ribbon. I’m loving the look of both items here! Unfortunately our hutch is no longer available, but I recently shared a post on very similar reclaimed wood hutch alternatives. 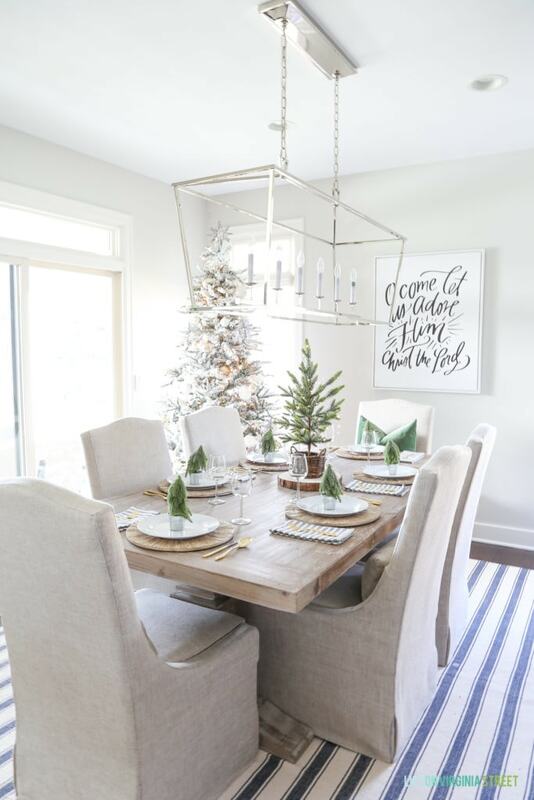 I’m loving just how festive this space feels for the holidays! You can shop most of the other items in this room below by clicking any of the images for more information. I hope you enjoyed my Christmas tablescape! 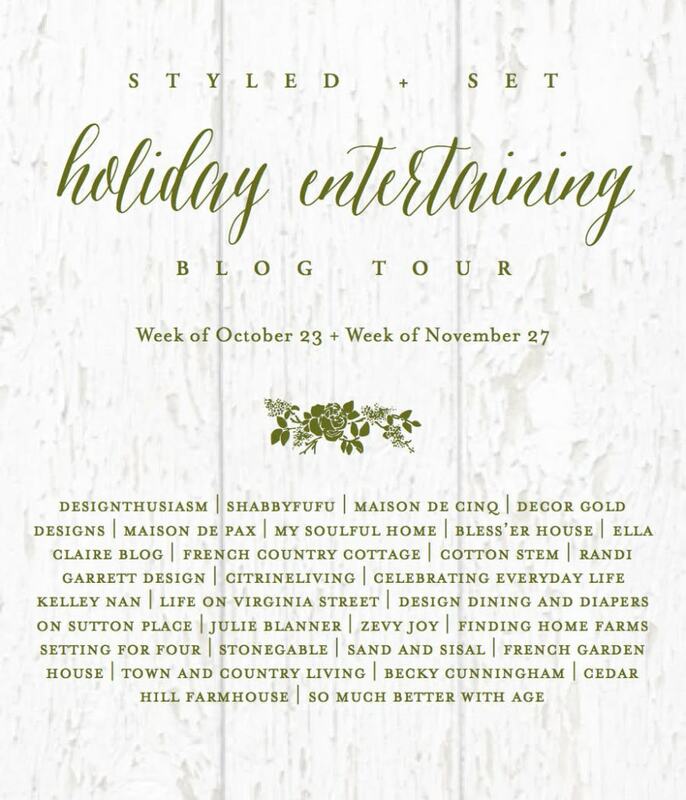 The next stop on the tour is my friend Jen from Decor Gold Designs! From the preview I’ve seen, her space is stunning! Be sure to also stop at all the other blogs on the tour. 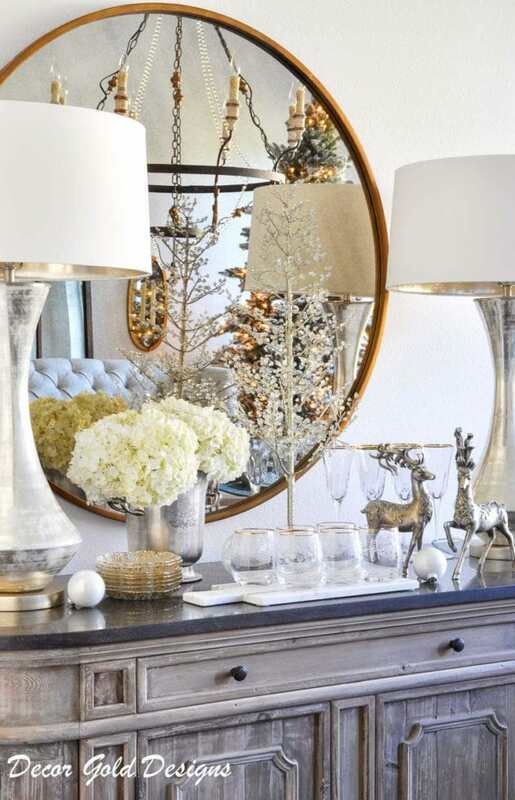 So many great holiday decorating ideas! Wow, Sarah! I love the look in here. The driftwood chargers are my favorite especially combined with the mini trees. I just picked up that tree in a basket this morning. I love the whimsy of it! I just love your blog. You are a person that is true to the readers as well as to yourself. From your story about cutting the Christmas Tree I could smell the pine, touch the needles and feel the Christmas Spirit. Thanks for being real. 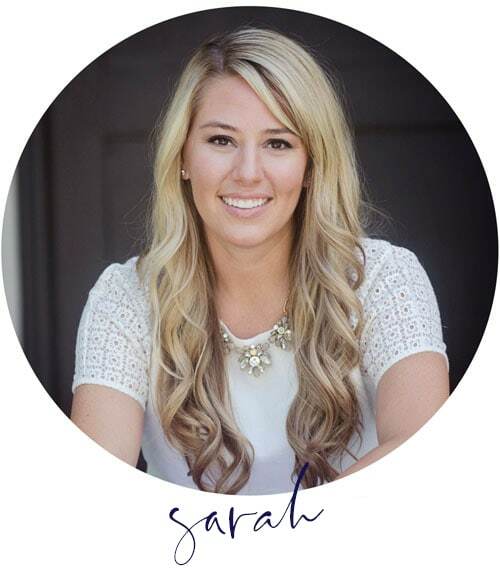 Beautiful job Sarah! 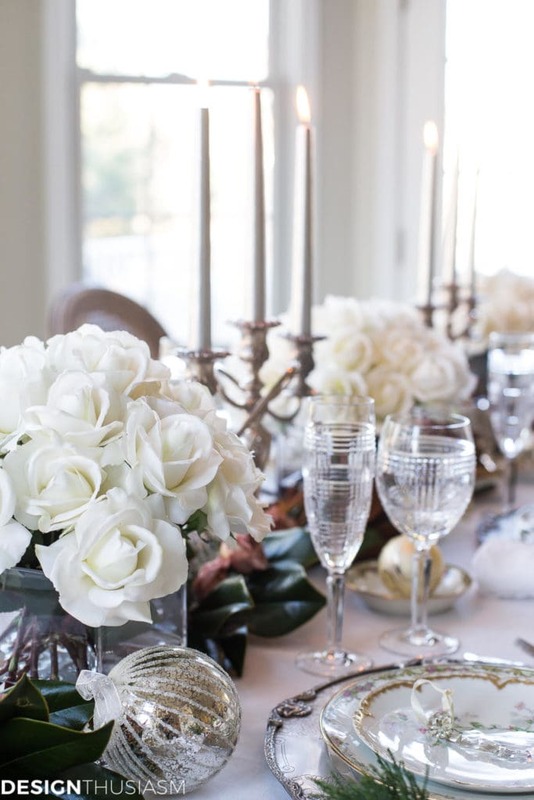 I’m loving how simple but lovely your table is! It’s definately a woodland , coastal look. Makes me think of being on the Northern California coast. ( where I’m from) love it!!!! I’m excited to see your new sofas! Sarah, this table, as well as the whole room, really speaks to me, especially where my head is right now! I’m craving clean lines and simplicity and you’ve done that beautifully here. 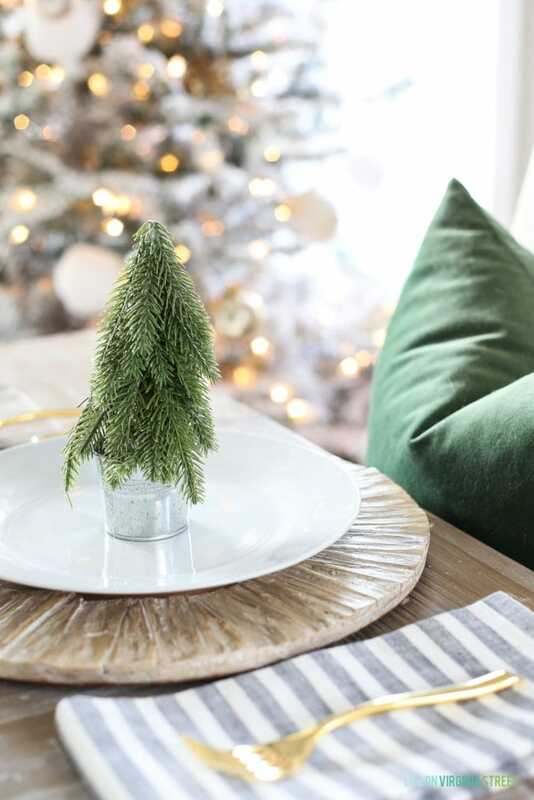 Your tree is stunning and perfectly dressed, yet I love how you let the greenery on the table breath with space around it. Both lovely and peaceful looking!! 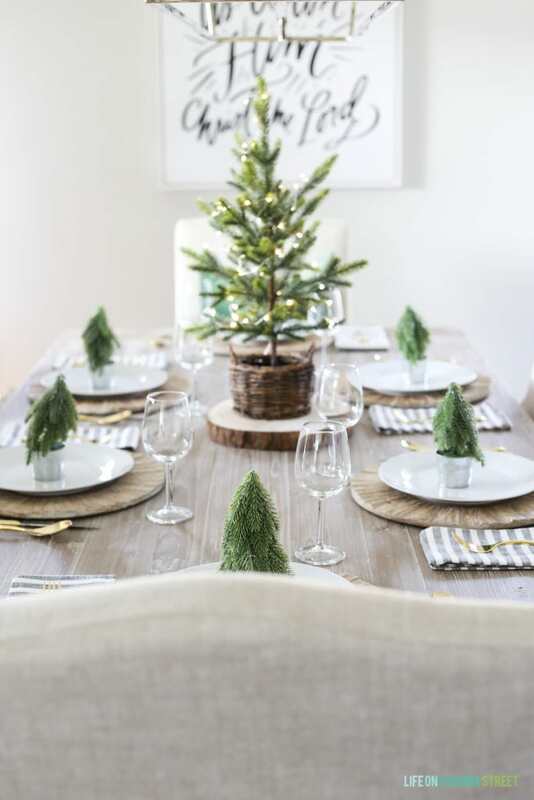 Your tree is stunning and I love the simplicity and elegance of your tablescape! Beautiful job. It’s gorgeous, Sarah! I love every detail. Aren’t flocked trees the best? I love this one you picked! Love the earthiness and simplicity of this so much Sarah! The tree in the basket is adorable, and I’m loving those little trees from Target. I saw them and didn’t get them, and now I wish I would’ve!! Your tables are always so clean and simple and gorgeous. 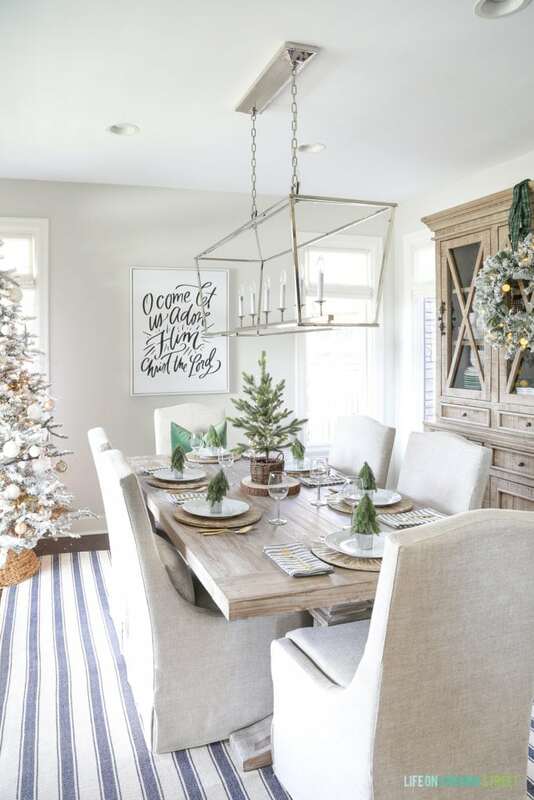 I love the green and white palette, and of course, anything looks good in your gorgeous dining room! wishing you happy holidays Sarah!